Chartered in 1802, Jefferson College constituted one of the first attempts at higher education in Mississippi. Incorporated by the first session of the Mississippi Territory’s General Assembly, the college’s antebellum benefactors included territorial governor J. C. C. Claiborne, geologist B. L. C. Wailes, and John A. Quitman. The founders located the institution in Washington, a small but flourishing village six miles from Natchez, the territorial capital. One of the few settled areas of the frontier territory, Adams County already had many wealthy planters, who, organizers hoped, would send both their sons and their financial contributions to the college. From the beginning, Jefferson College struggled. The school did not begin operating until 1811, when there were no students ready for a collegiate curriculum. The institution consequently operated as a preparatory school rather than as a college, and it never awarded a bachelor’s degree. Jefferson College was hurt by conflict between rural Adams County planters and the Natchez nabobs. While many planters from Washington and Adams County sent their sons to Jefferson, the Natchez elite preferred other institutions, including Oakland College in neighboring Claiborne County and schools in New Orleans and the North. The conflict between Washington and Natchez also led to financial troubles. 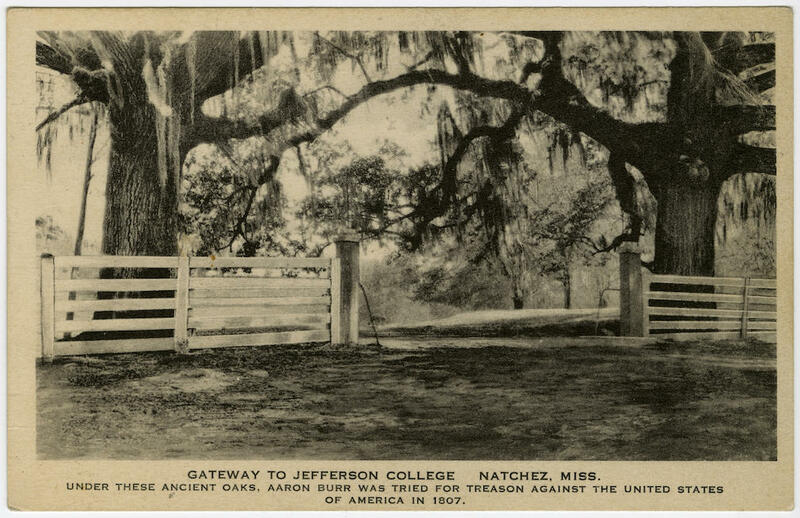 Although Congress had granted several lots in Natchez for the support of Jefferson College, attempts to lease those lots met with opposition from the city and led to a lengthy court battle. The death of the college’s president forced its closure from 1826 to 1829, and financial difficulties led to another closure in 1838. Fire struck the campus in 1841, destroying the main building, including the library and part of the territorial archives, which had been stored there. In the midst of such misfortunes, the college also had difficulty attracting and retaining students. The curriculum repeatedly changed as administrators sought to attract students with features such as military drill and a technical course in engineering, surveying, and agricultural science. Notable students included Jefferson Davis and Mississippi governor Albert Gallatin Brown. Naturalist John James Audubon taught at Jefferson College, as did novelist Joseph Holt Ingraham. The school functioned as the center of Washington’s social and cultural life, but as the town declined in population and importance, so too did the college. The Civil War brought additional problems to Jefferson College. The bulk of the student body enrolled in the Confederate military, and much of the faculty left as well. The college closed in 1863 and did not reopen until 1866. During the late nineteenth and early twentieth centuries, the school, now known as Jefferson Military College, continued to educate young men as a preparatory school, but it never achieved the level of stability or renown that its founders had intended, and it permanently shut its doors in 1964. The Mississippi Department of Archives and History has preserved the college as an official state historic site. Today, visitors can tour the college grounds, which also host educational programs and camps.